This hurricane season has been particularly rough, and in the aftermath of Hurricane Maria, ready to eat meals and water have been in short supply on Puerto Rico. We’ve been working with Feeding America, FEMA and Banco de Alimentos de Puerto Rico (our sister food bank), and their partners on the ground to transport and deliver the food that we collect to their 135 community food partners across the island. Thank you to all who donated food, water, and supplies. We’ve flown 19 pallets of water to the island through Feeding America/United Airlines, and we sent 2 pallets of meal boxes filled with protein-rich items like peanut butter and beef stew, as well as chili with beans and apple sauce (through a private plane secured by Bethenny Frankel). We collected three tractor trailers of water which were shipped to Puerto Rico. Daddy Yankee and his fans donated food, water and supplies; we’ve picked up approximately 300 pallets and arranged transportation to Puerto Rico. We’ve sent two truck loads of food and water, including items collected by Daddy Yankee’s fans, to Miami, FL and had them flown directly to Puerto Rico. Transportation was generously donated by the AMUR Foundation. We shipped seven tractor trailers of supplies and water to Georgia to be shipped to Puerto Rico. There are an estimated 1,500 displaced households in New York City right now, and FEMA, the Salvation Army, American Red Cross and the NYC Emergency Management office are running a Hurricane Service Center at 106th Street/Lexington Avenue where they are assisting people with completing benefit paperwork, answering questions about housing and sharing information about securing food and clothing. The center is distributing vouchers so that people who need food can pick up City Harvest-packed bags at a local food pantry. Through City Harvest’s hurricane relief efforts in Texas and Florida, we sent four tractor trailers of food and water to Houston and a truck load of food and supplies to Beaumont in mid-September. 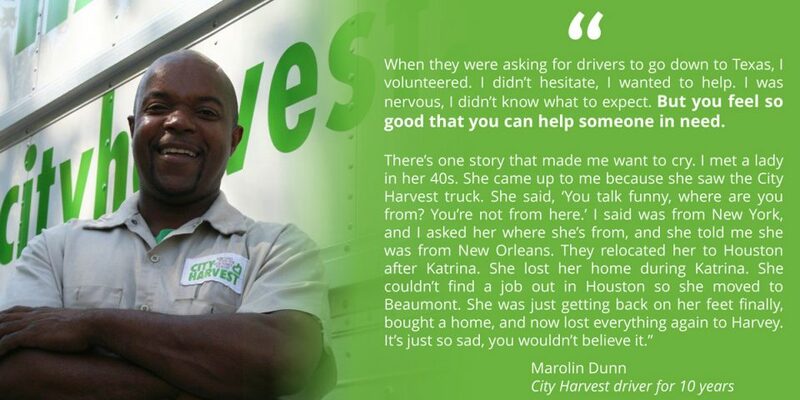 Our truck and several drivers volunteered through mid-October to assist with transport needs. Jenique Jones, our Director of Program Operations, and Racine Lee Droz, our Associate Director of Food Sourcing, spent time in Texas and Florida, respectively, providing guidance, and additional staff members have been available by phone to answer questions about infrastructure and fundraising best practices. 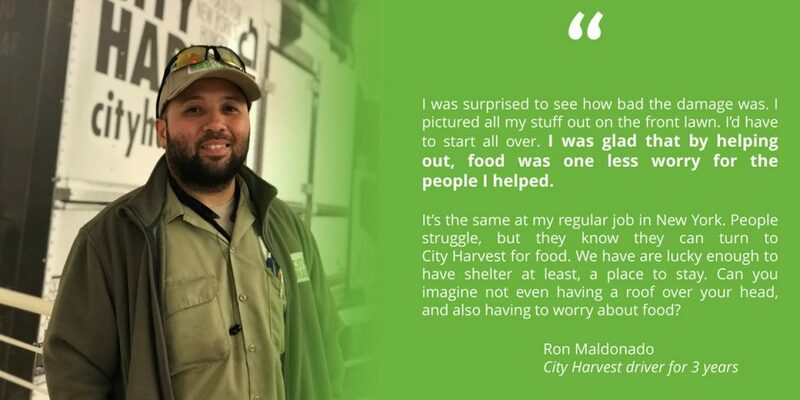 Thank you for standing alongside City Harvest.